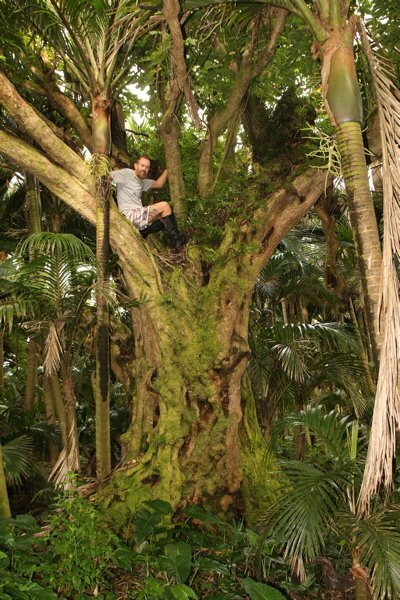 Located a short distance north from Mahoe hut, high on a spur on the southern end of the island is probably the largest fivefinger tree on the island, possibly in New Zealand. This hoary old tree must be well over a century old (Maloney, A.D., 2013). Estimated from photo using person standing at base of tree. Wide spreading tree of no great height, but huge trunk for its species. 10 Jun 2013 Maloney, A.D.
Five minutes walk north from Mahoe hut along the main ridge track.